Bedford Athletic stuck to their task and secured a nine-try 55 points to 7 win against bottom of the table Old Laurentians on Saturday. In a match where the strong winds did much to ruin the game as a spectacle, the side eventually overcame the adverse weather conditions to show glimpses of the form that has taken them to the top of the table this season. Playing with the wind in the first half, the opening try of the day came on nine minutes through Charlie Darlow. James Mortimer missed the conversion but the kick-off went straight to Steven Smith who ran the ball back through the entire visiting team to touch down for the second try of the day. Old Laurentians were enjoying a fair share of possession, but turnover ball was eventually secured and Stephen Woodhead escaped down the right wing for the third try. 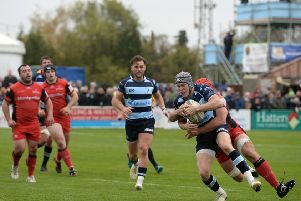 Mortimer converted this and the bonus point try on 27 minutes which was scored by David Simpson. Playing against the wind, Mortimer ensured that Athletic made the perfect start to the second half. A deep kick-off was dropped by the visiting defence and, from the scrum, Darlow went over for his second try, with Mortimer adding the conversion. The visitors did start to make good use of the wind and eventually went through sufficient phases to score a converted try on the right wing, touched down by Andy Coleman. Athletic were soon back on the attack, with Woodhead sprinting away down the right wing and Darlow finishing the move in the centre of the park for a try converted by Mortimer and a 38-7 lead in the 57th minute. Thereafter Old Laurentians began to wilt. On 63 minutes Smith capped a man of the match performance by spotting the space behind the visiting line and putting a neat grubber kick through for Woodhead to run onto and score. Tommy Mills was on hand to finish off another lightning attack 10 minutes later, Mortimer this time converting before Woodhead again showed the defence a clear pair of heels to sprint away for his hat trick-try on 77 minutes, equalling the earlier efforts of Charlie Darlow. Table topping Athletic face another tough away test at Paviors this Saturday, with Derby six points behind.